Young horseweed seedling with lobed leaves beginning to form a rosette. 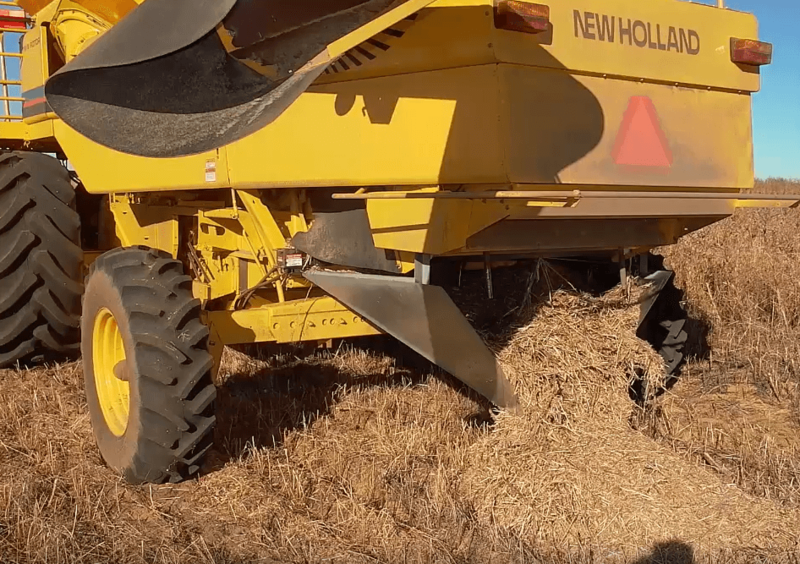 Video Part 1: Important facts to know about marestail’s biology and spread that will help facilitate optimal management. 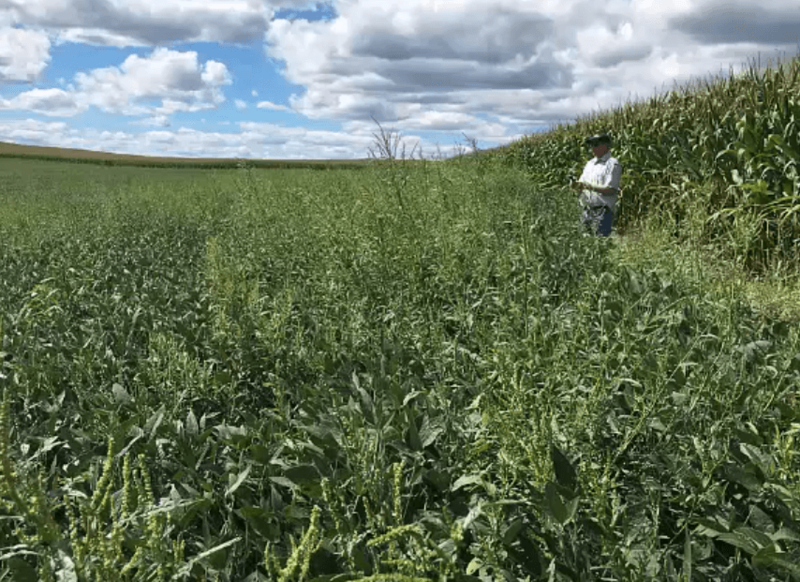 Video Part 2: The best management practices and herbicide recommendations for marestail, with particular focus on what should be done to target herbicide resistant populations. Summary: Horseweed (also called marestail) is of rising concern in many states due to its rapidly spreading herbicide resistant populations. It is a winter annual, and its seeds are wind-dispersed. It should be controlled when seedlings are small in order for herbicide applications to be effective, and not allowed to go to seed. Because seedlings emerge in both the fall and the spring, fields should be scouted for horseweed in the fall and treated with a fall burndown and/or a fall cover crop to prevent those seedlings from re-emerging in the spring. Glyphosate (Roundup)-resistant marestail is prevalent throughout the US, with ALS-resistance (Group 2; i.e. FirstRate, Classic) in some areas. It is particularly challenging in no-till and reduced-tillage systems, where integrating multiple tactics often becomes necessary. To prevent resistant populations from establishing, management programs need to avoid reliance on glyphosate and ALS herbicides, diversify herbicide modes of action (MOA), and integrate appropriate chemical and non-chemical control tactics. This winter annual weed emerges in both fall and spring (September-November and April-early June in the mid-Atlantic). Most fall-emerged plants survive the winter and keep growing in the spring, at which point they become harder to control. Seedlings have small lobed leaves that grow into rosettes. The rosettes “bolt” into upright stems that produce up to 200,000 seeds and reach up to 6 feet tall. The seeds are wind-blown long distances, spreading to neighboring farms, counties, and states. 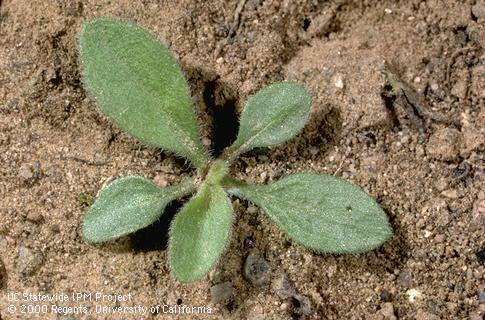 Once plants grow above 5 inches tall, they are very difficult to control with herbicides alone. Marestail is more prevalent in no-till, reduced-till, and perennial production systems compared to annually tilled fields, because it thrives in landscapes where soil is not disturbed. While it can infest all row crops and forages, it is most challenging to control in soybeans due to limited herbicide options and soybean’s summer annual life cycle. Winter wheat and winter annual cover crops develop thick canopies in the early spring, shading out spring-emerging horseweed. But in Pennsylvania, soybean and corn planting happens after marestail has already established. Marestail can often recover and produce viable seeds following damage by ineffective herbicide application, grazing or mowing. A high-biomass winter annual cover crop can suppress a high percentage of marestail in the spring. If it is left on the field after termination, it can also shade out marestail that emerges after cash crop planting. A vigorous species like cereal rye should be planted after fall harvest and allowed to grow for several weeks into the spring. This allows it to accumulate biomass so that it can function as a weed suppressive mulch that the crop is later planted into. In general, 4000 lb or more dry matter is necessary prior to termination, in order to actively suppress emerging weeds in the spring. Higher biomass can be achieved by earlier planting dates and later termination dates. Before planting cover crops for weed suppression, please contact your county extension agent for more information, as results depend on various management decisions and individual farm factors. 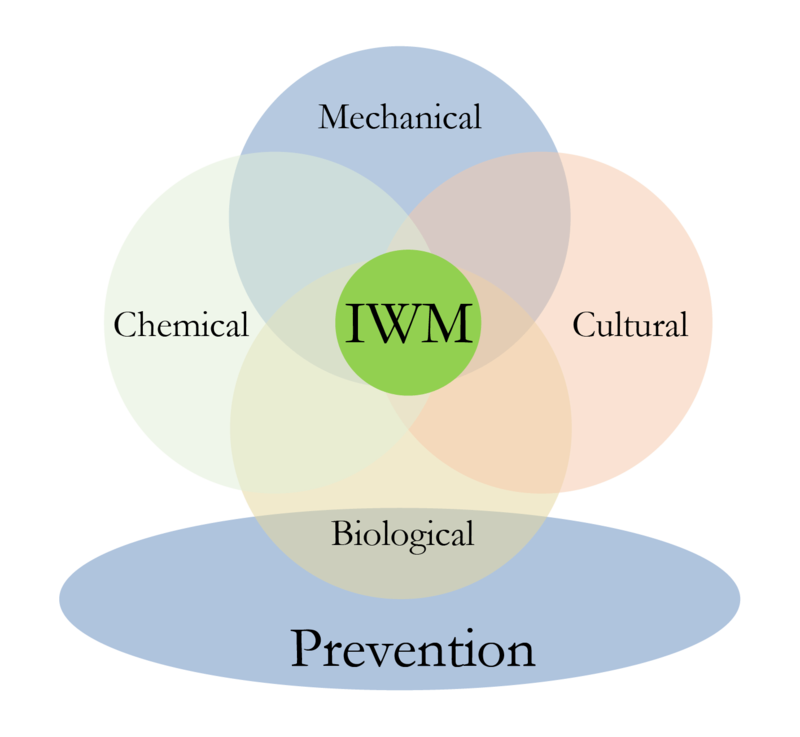 Cultivation, mowing, hand removal, and tillage are all mechanical tactics that help manage horseweed. Hand-pull mature plants before they flower, so they cannot drop seeds and reproduce. Cultivation may be used to uproot plants under one foot tall. Mowing slows horseweed growth but must be done frequently to stop regrowth and seed production. Marestail is more common in no-till and reduced-till fields. In tilled fields, late spring tillage uproots seedlings prior to planting.